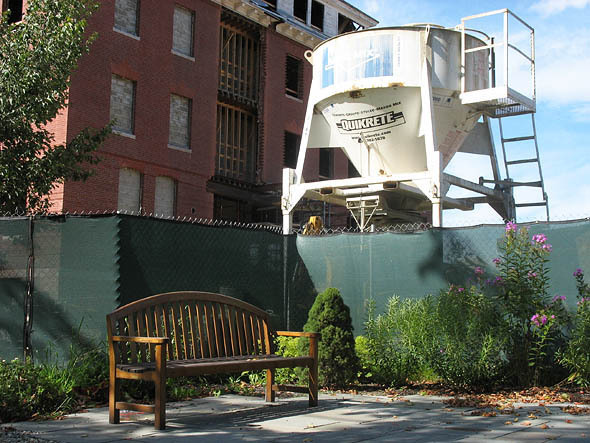 As this was written, on Aug. 20, Hedge Hall was something to watch as a crane swung long steel beams across the blue sky toward the building. There’s plenty of new steel in Hedge already, says project manager Paul Farnsworth, but the creation of the building’s framework will become more of a spectator sport as it increasingly happens outside the building’s shell. 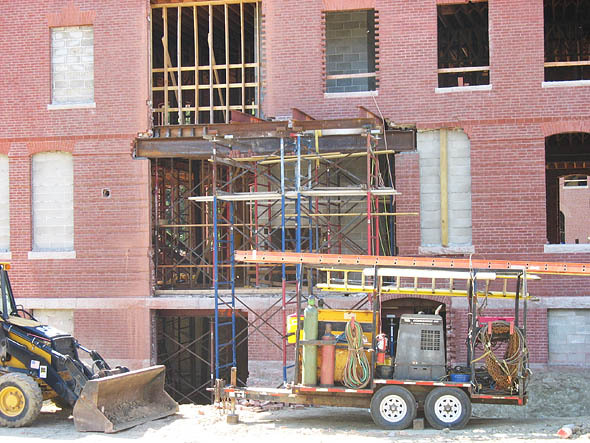 That will include the skeleton for the building’s addition, adjacent to Alumni Walk — and the foundation for that addition was completed this week. Then comes the roof structure. But before the roof work can be done, how about a place for the workers to stand? The original plan for the roof was to strip it all off and rebuild it completely. But general contractor Wright-Ryan Construction decided that time could be saved by retaining the remaining roof a while longer while the structure is built underneath. In an interesting angle to the steel discussion, Farnsworth notes that after the beams are set in place, the bolts fastening them still must be tightened to an appropriate, er, tightness. Or, in the words of people like Farnsworth, who actually know what they’re talking about, torqued. You can use a torque wrench, which shows you how tightly a bolt is turned. But later, when it’s time to inspect the steelwork, going around with a torque wrench to check the tension on every bolt would drive you nuts. So instead the bolts are manufactured with cleverly engineered little extensions on the end. When the bolt is tightened up to spec, Farnsworth says, “the end breaks off, by design. Then, when they’re inspecting it, they don’t have to go around with a torque wrench.” The inspectors just look for the broken-off ends. 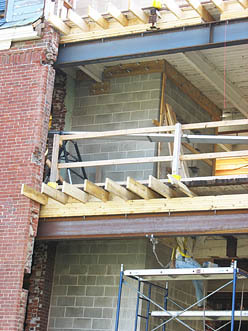 Roger Williams Hall is next in line for interior steel. You can see the smallish square holes in the roof into which columns will be lowered. A little steelwork has been done at the Bill already — perhaps you have seen the beam, set into the east wall, that will support a lintel over a passage between the new and old parts of the building. So, much more steel is on the way. But you don’t need Campus Construction Update to tell you — although we will anyway — that with this sort of work you always have to do something else before you can do what you set out to do. In this case, if you are going to hang a lot of steel, you need space to store it. And the Hedge-Roger Bill worksite currently doesn’t have much space because there’s so much excavation going on — digging for utilities and for foundation access. He adds that no additional excavations outside the fence are expected. The steam line installation between Hedge and Ladd Library, which required a big long trench that closed off the service road behind Ladd, is nearly done. The trench around the foundation of Roger Bill will be filled in soon, covering up the attractive Orangesicle-colored damproofing. And what’s left for the underground work — a little more steam work near the Bill, and chilled water lines between the Bill and Hedge — will be started next week. “Chilled water” lines? Farnsworth explains that a big water chiller in Chase Hall feeds the air conditioning in Chase, Ladd and Carnegie Science. Installing new, more-efficient air handlers into Ladd last year gave the system extra capacity. So during the Hedge-Ladd steam pipe replacement, chilled water service was extended to Hedge, whence it will connect to Roger Bill. “It’s an efficient way to do it because it’s one central plant,” says Farnsworth. “The new projects don’t have to pick up their own cooling equipment. And you don’t have to find a place outside each building for the heat rejection portion” — that is, A/C exhaust. 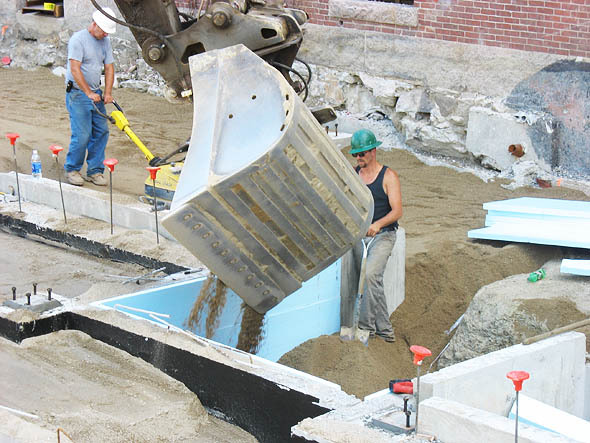 Read about a new student residence and the renovation of Garcelon Field. And here are the plans for the renovations of Hedge and Roger Williams halls.